We cycled from Sydney past lovely beaches down the east coast to Melbourne, twice around beautiful Tasmania and around Victoria's spectacular Great Ocean Road to Adelaide. From there we rode up through desolate Coober Pedy to Ayres Rock, Kings Canyon, Alice Springs and the West MacDonnell Ranges. More riding through the red centre had us in the tropical top end and riding through Katherine, the magical Kakadu and steamy Darwin. We rode across the picturesque Kimberly to Broome, across the Great Sandy Desert to the Pilbara, the far west coast at Exmouth and eventually Perth. At Perth we chose the only sensible way to travel home, by bicycle. Leaving Perth we slogged through the rain and the cold around the capes to Albany and then Esperance. From there we raced across the Nullarbor, battled headwinds down and up the Eyre Peninsular and across the farmlands of South Australia to the Murray River. We followed the Murray's brown murky waters across flat boring plains past flat boring farms till the water was clear and clean at Albury. We snaked through the foothills of the Snowy Mountains by Australia's Greatest River, across the forested Koscusco peaks to the nation's capital. From Canberra a short hop through the picturesque Southern Highlands on New South Wales had us riding the magical Illawara coast back to Sydney just a year later. 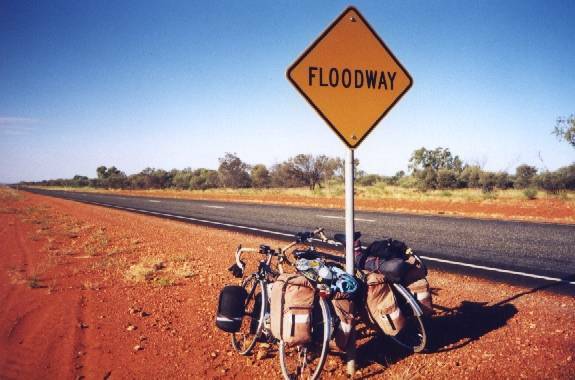 In all we rode across the Great Dividing Range three times, across the Murray River eleven times and we crossed the entire continent four times. Tasmania's C roads are usually brilliant. (All Tasmanian roads are classified A - Main highway, B - Secondary road, and C - cyclists roads.) On the day to Campbelltown we were riding with the Western Tiers to the right, Ben Lomond to the left, flat picturesque countryside ahead, sunny day, not too hot, a no traffic sealed country lane, tailwind and gentle downhill, 40kph with no peddling. Like I said, brilliant. We cycled from Hobart to Devonport across Tasmania's Central Plateau in just 3 days. A lot of very enjoyable riding over rolling hills though the upper Derwent Valley and the farming country around Bothwell. It took 2 days to climb past the Great Lake (1037m asl) at the peak of the Plateau, and 20 minutes to be back on the plains at Poatina. The Stuart Highway from Port Augusta to NT was built in the 1980s, and is splendidly engineered. It is wide and very gently graded. There are very few straight stretches, mostly long gentle curves. I didn't notice any point you couldn't see at least a kilometre of road ahead. The result was fast even tempo riding. I only used the granny gear once, and didn't crack 40kph until we reach the Northern Territory. The arid land scenery is surprisingly variable, and especially beautiful around dawn. Of course there are some long stretches where it's a bit stark. 100km either side of Coober Pedy there is nothing but gravelly rocks and short stubby salt bush. The dry salt lakes and barren tablelands around Woomera also look just the slightest bit barren. From the A/NT border the road climbs several ranges to reach Halls Creek. The terrain then flattens out with lots of pindan wattle and holly leaf grevillea scrub. This might still be the Kimberly, but hills and gorges are a very long way apart. Tens of thousands of flowers line the route, making it only slightly less monotonous. Fortunately the wind was kind to us across this stretch. The few cyclists we've met coming the opposite way tell a familiar story of riding at night to avoid ploughing into the wind. We anticipated the 620km stretch from Broome to Port Hedland to be the hardest of the trip. The area is renowned for westerly trade winds and there are no roadhouses or other water sources for the first 300km. We left Broome with 3 days water and a cold dinner menu plan trying to get to Sandfire. After 72km the headwind became a tailwind, and we arrived at Hedland three and a half days later, still carrying 5 of the 25 litres of water we'd lugged from Broome. By the time we'd left Robourne the winds were so strong they were considered unusual by the locals. At times we were sitting on 30km/hr, faster if we elected to pedal. Around Margaret River (250km SE of Perth) and the timber town of Pemberton (300km Sth of Perth) we got to exercise the full range of our bike's gearing. We were either going up or going down. When it wasn't threatening to rain it was raining. When it was neither threatening nor actually raining it was hailing. You haven't lived until you've cycled downhill into a hailstorm and felt pellets of ice bounce off you. An hours riding at dawn saw us reach the start of "90 mile straight" on the Nullarbor crossing, a section of road 146km long without a single bend. In spite of these claims it does have a few minor twists that only a bored cyclist can spot. With just the occasional tree or shrub this plain is brutally exposed to the wind, and could have taken days to cross. With a brisk south wester behind us we did it in 5 hours. We pushed on to the next roadhouse at Cocklebiddy, only making it at dusk as the wind turned against us. After two and a half days of headwinds and just half a day of tailwinds I was starting to feel just a touch cheated, especially watching the TV weather forecast showing the dreaded "high in the bight". Mind you, if I had to nominate a spot to have half a day of tailwinds this would have been it. By northern Victoria and riverina of News South Wales (NSW) the attitude of our fellow road users started to change. We stopped waving at people. The familiar friendly return waves were replaced with strange looks. We now look forward to seeing long distance truckies on the road, as they are the only ones who can be relied upon for a friendly wave. I don't know if it was because of school holidays, we were too close to Melbourne, it was a Sunday, it was the day after the AFL Grand Final or we were just unlucky. Regardless, we felt quite fortunate none of the multitude of people who tried to kill us as we rode along the Murray Valley highway were successful. Riding in a combination of aggressive and careless heavy traffic can make you a bit paranoid. You start thinking everyone is out to get you. It's really only every second person. After weeks of flat straight headwind riding in the riverina the gentle and not so gentle undulations and contour curves were great fun. The scenery around the upper storage dam on the Murray nestled in between the foothills of the snowy mountains was just magnificent. Lush green farms, hills, mountains and even real forests. The climb out of Khancoban through the imaginatively named Back Creek Valley was beautiful, if slightly slow going. I did manage 69kph on descent from Scammells Ridge before the discretionary part of my valour took over. The climb up to Leather Barrel Creek is now mostly sealed, but it is still very steep. We managed it at about 6km an hour. Lawrence Hargrave Drive is a spectacular stretch of road that curls around Wollongong's far northern suburbs. At times it runs right under towering cliffs while simultaneously threatening to slip into the ocean, which its done quite a few times already. Its one of the best rides in Australia, with Victoria's Great Ocean Road bettering it only in length. Riding in Sydney's city traffic was far worse than I remember. All of the quiet wide roads I used to commute to work on have been got at by the local councils. They are now veritable obstacle courses, with roundabouts, shrubs, parking bays and ill-advised bike lanes turning isolated stretches of safe pleasant cycling into narrow challenging nightmares. The "out of my way, dickhead" attitude of the car drivers that is fairly well confined to Sydney doesn't help either. We were sworn at, glared at and gesticulated at almost constantly, and that was just as pedestrians. It was enough to make it feel a relief rather than an accomplishment to get off the bikes in Sydney having ridden across Australia four times.